Just published and recently mailed to members is a double issue of Musica Judaica - more than 400 pages of articles, book, record, and concert reviews. 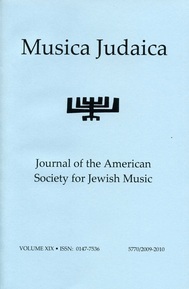 Voume XIX also includes all of the reviews from ASJM's latest initiative, Musica Judaica Online Reviews (www.mjoreviews.org), which allow the Society to publish commentary more closely to the publication date of the items which are being reviewed. As the Jewish Music Forum enters its ninth season, the American Society for Jewish Music is pleased to announce that, in addition to its sessions in New York City and in other locations around the country, the Jewish Music Forum will hold its first session in the south. Hosted by Tulane University in New Orleans, the day-long session, "Jewish Music in New Orleans," will be held on Monday, March 4th (with a concert the preceeding evening). A preliminary program can be accessed above.